Highly-centralized DVD cloner/copier, ISO mounter and DVD Burner. WinX DVD Copy Pro 3.7.2 was available as a giveaway on June 24, 2017! Seek for quality lossless DVD backup solution? WinX DVD Copy Pro has been always the first choice to make 1:1 backup of general DVDs, 99- title DVDs, even DVDs with scratch/bad sector/new copy protections. Fully meets your DVD backup demand: The input can be DVD-Video disc, DVD folder, or DVD ISO image. Forged with 9 refined copy modes, it can faultlessly copy DVD to DVD disc, ISO image, VIDEO_TS or MPEG2 file; back up DVD chapter; extract audio video; mount DVD ISO image and burn ISO image or VIDEO_TS to DVD disc. Unique sector-by-sector DVD duplication: ensure a 100% original copy in quality, structure and content; repair corrupted sectors to the greatest degree. Occupying less than 1% average CPU, it is tested to produce a perfect DVD copy within 12-17 minutes. Bonus Offer: Here is an exclusive discount for GOTD users to get "Lifetime Free Upgrade License" at $19.95. 70% off its original price $67.95. Valid only for 48 hours! 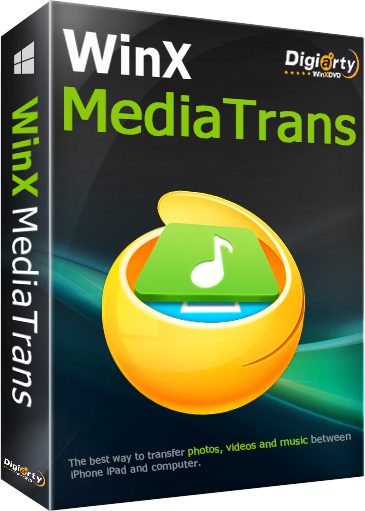 How would you improve WinX DVD Copy Pro 3.7.2? Convert homemade and commercial DVD to AVI, MP4, H.264, WMV, MOV, FLV, iPhone, iPad, iPod, Apple TV, PSP, all popular Android devices and Tablets. Always the 1st to support new and damaged DVDs. Unlock any DRM. Support hardware acceleration. No.1 fast DVD ripper in the world. Indispensable iPhone/iPad/iPod files manager, transfer & converter. Transfer music, video, eBooks, etc. between iDevice and PC; manage music; export 4K photos/videos to free up more space; auto detect & convert iOS- unsupported videos & music, remove DRM ; Create ringtone, manage Voice Memos; use iDevice as USB. How time’s fly! WinXDVD has been 11-year-old in the road of multi-media software development. To celebrate this big birthday, we are delighted to provide the latest version of WinX DVD Copy Pro for free to all your guys. Moreover, you can download a licensed copy of this program from Digiarty official page before Jun.25. 3. Click "Get Giveaway License" button, you can easily see license code. Want to gain “Lifetime Free Upgrade License”? Here are two unique ways for you to get it now. Digiarty Support Team and GOTD, thank for the gift! This was a rather disappointing experience. I tried many times to install this software but it was obviously defective from the start. --No program should ever require that! Plain and simple, it was a very bad way to package the giveaway like this. Oh, but you had to have your website traffic, didn't you? Now you are known for the installer that failed to install a little 30MB program. Yay, you! This was a rather disappointing experience. I tried many times to install this software but it was obviously defective from the start. Some user suggested that we reboot in safe mode to install... That is completely insane --No program should ever require that! Plain and simple, it was a very bad way to package the giveaway like this. Oh, but you had to have your website traffic, didn't you? Now you are known for the installer that failed to install a little 30MB program. Yay, you! Brilliant strategy there, guys. Already downloaded version 3.7.1 from GOTD last year and used it to my entire satisfaction. Don't see exactly the difference with 3.7.2, but downloaded and installed this last version with no problems on XP Pro and Win 8.1. Great program and easy to use. Thanks to Digiarty and GOTD ! Does this software work with the Cineva copyright protection ? Is there a difference between this version and the last giveaway from either December or November 2016? Thnx!! I couldnot install on a Win XP Pro pc. The installation was accepted but the license key was not. Initially i noticed that the license was in a different format than the one I received. The i received was in a 2-8-6 format, the asked for format was 2-7-7, even when switching, it was not accepted. For some reason your GOTD programs are not installing under windows 10... does anyone else report this problem? I downloaded winXDVDCopyPro , but i can not find out where to enter the License Code? of DVD9. 98% of movies are DVD9's. It would be nice if this App had a compression feature, so that you could copy DVD 9 to a DVD5. DVD5's are dirt cheap compared to the blank disks of DVD9. 98% of movies are DVD9's. I have used an earlier version and it worked quite well for me. i cant install it,It proceed thru activations page and not more.Iam win 10 user I also got awast antivirus. i had your older one that i had deleted then i "tried" to down load then new one 3.7.2 it downloaded fine but when i went to open it, it want open or anything. whats going on and now i don't have the old one can you please help thank you so much. Does this program allow to copy DVD9 to DVD5? Last version did not. Do any of Digiarty programs do this? I received the installation.zip file via email, not Facebook. After unpacking and running the setup file, the program installed and reported that I needed to restart my Windows 10-64 laptop to finalize the installation. I did so and expected to see the install routine return and ask me for the activation key that I knew I would have to find at the website per the instructions. But that did not happen. My laptop booted up normally to my desktop. I found the program icon on my desktop and clicked to start it. It came up fully licensed as the "Giveaway Version of WinX Copy Pro V3.7.2" At no time did it ask for the license key. Would this behavior be due to having a previously installed version of the same program, received via GOTD 2 years ago? I received the installation.zip file via email, not Facebook. After unpacking and running the setup file, the program installed and reported that I needed to restart my Windows 10-64 laptop to finalize the installation. I did so and expected to see the install routine return and ask me for the activation key that I knew I would have to find at the website per the instructions. But that did not happen. My laptop booted up normally to my desktop. I found the program icon on my desktop and clicked to start it. It came up fully licensed as the "Giveaway Version of WinX Copy Pro V3.7.2" At no time did it ask for the license key. Would this behavior be due to having a previously installed version of the same program, received via GOTD 2 years ago? I too cannot install this software noting happens or I get corrupted setup file message - any ideas? Downloaded and ran the setup.exe, but nothing is installed ??? Been using this program for several years - thank you very much for the updated version. I still had version 3.6.5 (also from giveawayoftheday.com) on my PC when I installed this new version. After the restart, I went to the Digiarty site listed in the Readme file and copied the activation code, but when I opened the program it already indicated that it was licensed and did not give me the option to input the new code. WinX DVD Copy Pro has always worked, and their "sector-by-sector DVD duplication" sounds like it *may* be the only way to make a backup copy of a DVD with Cinavia [DRM embedded in the audio] -- but that's just a guess that would have to be tested. It may also allow backing up a new release if the DVD has a new type of DRM... DVDs are sometimes created out of spec as a DRM measure, & while the developers of similar software will usually figure it out, that can take a little while, & may require a new version of their software. WinX's sector-by-sector copy OTOH may work right off the bat. Most all content on a DVD is mpg2 video, and copying or saving DVD video to a regular mpg2 file without having to use additional software is a nice feature. The downside is that this once almost universal standard video format is starting to be, I guess "ignored" might be the best word, as the mpg2 decoder is not included in Windows any longer, or Android, though VLC, including the Android version, should work. You can of course use something like the WinX DVD Ripper to re-encode [convert] DVD video to the AVC video most hardware & software expects -- at a bit rate of around 1.5-2 you should cut the file size roughly in half. The problem there is that many DVDs nowadays are created from the start to have very limited video quality to discourage just this sort of conversion. Subtitles &/or captioning unfortunately are a hassle... DVD players [stand-alone & software] will display a DVD's subtitles, but while the video can usually be upscaled with sufficient quality to be watchable on a HDTV [or any higher rez display], DVD subtitles are images that don't really scale well. The mpg2 video on a DVD can include embedded captioning, & since it's basically text rather than images it scales better, but players that handle it are rare, and it won't pass through the HDMI cable from a stand-alone player to a HDTV. AFAIK the most common &/or popular solution is to OCR the original subtitles using something like the free SubtitleEdit -- you *may* need to copy the DVD to your hard drive 1st. Saved to a .srt text file, most players nowadays will display these subs as long as the .srt file is in the same folder as the video, and has the same name as the video file, e.g. MyVideo.mp4 & MyVideo.srt. DO NOT download subtitle files you find online -- recently they've been used to spread malware infections, since there's little or no security measures in the software code that displays subtitles. DVDs come in two sizes, single layer & dual layer, storing around 4.5 & 8 GB respectively. If you want to burn a DVD, rather than storing the DVD's files on something like a hard drive, often backing up [copying] just the main title video, without unneeded audio & subtitle tracks, will give files small enough to fit on a single layer DVD. When they won't fit, &/or when you want all the special features & menus etc., & that won't fit, burning a dual layer disc is the preferred way to go -- while converting DVD video to AVC may result in marginal video quality, depending on the DVD, cutting the mpg2 bit rate, so it fits on a single layer DVD, can be worse. While not saying that there's anything wrong with the burning tools in WinX DVD Copy Pro, I will say that the most popular tool to successfully burn dual layer video DVDs is the free ImgBurn. Note that ImgBurn will ask you to choose what's called the Layer Break, which is the point at which the burning starts on the 2nd layer. It's usually not that big of a deal, but I didn't want it to come as a maybe confusing surprise. If interested you can find info online, including in the ImgBurn forums, but note that some of what you'll read may have been written when [much] less capable players were the norm, and you had to take more care in where Layer Breaks occurred. WinX DVD Copy Pro has always worked, and their <i>"sector-by-sector DVD duplication"</i> sounds like it *may* be the only way to make a backup copy of a DVD with Cinavia [DRM embedded in the audio] -- but that's just a guess that would have to be tested. It may also allow backing up a new release if the DVD has a new type of DRM... DVDs are sometimes created out of spec as a DRM measure, & while the developers of similar software will usually figure it out, that can take a little while, & may require a new version of their software. WinX's sector-by-sector copy OTOH may work right off the bat. Most all content on a DVD is mpg2 video, and copying or saving DVD video to a regular mpg2 file without having to use additional software is a nice feature. The downside is that this once almost universal standard video format is starting to be, I guess "ignored" might be the best word, as the mpg2 decoder is not included in Windows any longer, or Android, though VLC, including the Android version, should work. You can of course use something like the WinX DVD Ripper to re-encode [convert] DVD video to the AVC video most hardware & software expects -- at a bit rate of around 1.5-2 you should cut the file size roughly in half. The problem there is that many DVDs nowadays are created from the start to have very limited video quality to discourage just this sort of conversion. Subtitles &/or captioning unfortunately are a hassle... DVD players [stand-alone & software] will display a DVD's subtitles, but while the video can usually be upscaled with sufficient quality to be watchable on a HDTV [or any higher rez display], DVD subtitles are images that don't really scale well. The mpg2 video on a DVD can include embedded captioning, & since it's basically text rather than images it scales better, but players that handle it are rare, and it won't pass through the HDMI cable from a stand-alone player to a HDTV. AFAIK the most common &/or popular solution is to OCR the original subtitles using something like the free SubtitleEdit -- you *may* need to copy the DVD to your hard drive 1st. Saved to a .srt text file, most players nowadays will display these subs as long as the .srt file is in the same folder as the video, and has the same name as the video file, e.g. MyVideo.mp4 & MyVideo.srt. DO NOT download subtitle files you find online -- recently they've been used to spread malware infections, since there's little or no security measures in the software code that displays subtitles. Single vs. Dual Layer DVDs... DVDs come in two sizes, single layer & dual layer, storing around 4.5 & 8 GB respectively. If you want to burn a DVD, rather than storing the DVD's files on something like a hard drive, often backing up [copying] just the main title video, without unneeded audio & subtitle tracks, will give files small enough to fit on a single layer DVD. When they won't fit, &/or when you want all the special features & menus etc., & that won't fit, burning a dual layer disc is the preferred way to go -- while converting DVD video to AVC may result in marginal video quality, depending on the DVD, cutting the mpg2 bit rate, so it fits on a single layer DVD, can be worse. While not saying that there's anything wrong with the burning tools in WinX DVD Copy Pro, I will say that the most popular tool to successfully burn dual layer video DVDs is the free ImgBurn. Note that ImgBurn will ask you to choose what's called the Layer Break, which is the point at which the burning starts on the 2nd layer. It's usually not that big of a deal, but I didn't want it to come as a maybe confusing surprise. If interested you can find info online, including in the ImgBurn forums, but note that some of what you'll read may have been written when [much] less capable players were the norm, and you had to take more care in where Layer Breaks occurred. got the license code but it never installed? For those who are interested, here is the changelog: https://www.winxdvd.com/dvd-copy-pro/updatelog.htm. It’s very interesting to launch the full version contest with candidate number. No worry about the email be leaked out. Already submitted my email and received the number, the next step is waiting for your winner email, right? What does "Highly-centralized DVD cloner/copier" mean? How can you be highly-centralized? I am highly-confused. Nancy Parent, you can turn off your antivirus tool firstly, and then try to install it again. Nancy Parent, I was having the same problem, but I just learned the solution, and it works! Restart your computer in Safe Mode With Networking, and then click on Setup for your downloads. I'm very happy to have learned this trick! Cannot install in latest updated Win 10 HP, with Avast on or off. Goes directly to the activation notice. This has never happened before with GOTD gifts. Usually, if there's a problem, I can simply turn off Avast briefly, and the installation proceeds properly. Anyone else having this issue? anaceguy, you can restart your PC and run in safe mode with networking! anaceguy, Yes -- this has been happening to me regularly for the past month or so. No, it never happened before! Hopefully, Mr. Thang's suggestion will work! Recently got a pile of DVD bargains on Bestbuy, and I reeeeally love watching movies and TV shows on DVD on summer nights! So far winx has never disappointed my needs for excellent DVD backup performance, which pretty much hits the nail on the head with what I nitpick for ORIGINAL quality (ex. Copy DVD to MPEG2). The program deserves a devoted upvote from a DVD aficionado, Thx! Installation and setup is successful with a few clicks. :D Recently got a pile of DVD bargains on Bestbuy, and I reeeeally love watching movies and TV shows on DVD on summer nights! So far winx has never disappointed my needs for excellent DVD backup performance, which pretty much hits the nail on the head with what I nitpick for ORIGINAL quality (ex. Copy DVD to MPEG2). The program deserves a devoted upvote from a DVD aficionado, Thx! I agree with you. By the way, are you Danish.? Catherine.W, I agree with you. By the way, are you Danish. ?